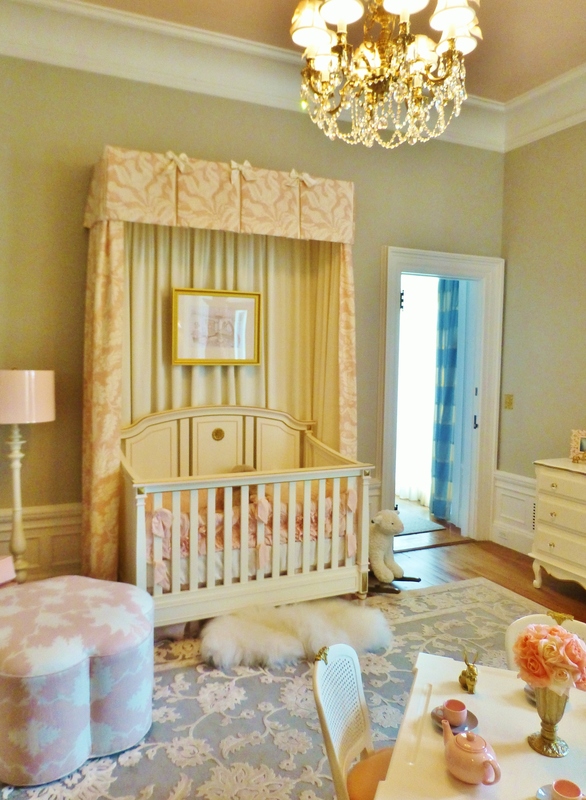 The designer of this high-end infant abode, Ms. Badolato, did a fantastic job in making the nursery feel luxuriously feminine, while not coming across too saccharine and overly sweet. 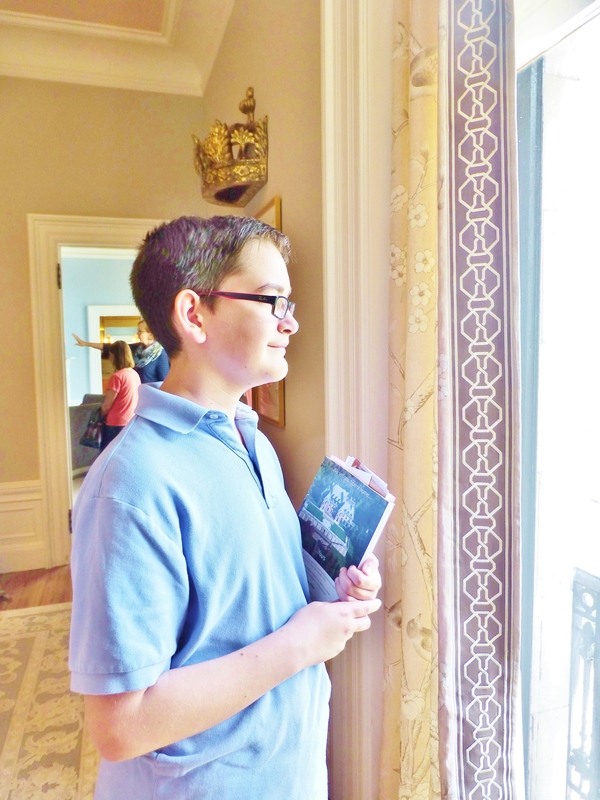 Today’s featured room from my 2014 Mansion in May tour of Blairsden is called ‘La Petite Rose’, decorated by Kristin Badolato of Kristin Ashley Interiors. This adorable baby’s room is not a typical nursery. The wall color is described as soothing taupe, but I would say it’s closer to a pale warm grey with taupe undertones. The neutral stone-like color works amazingly well alongside the soft pinks and flesh-tones used as accents throughout the room. 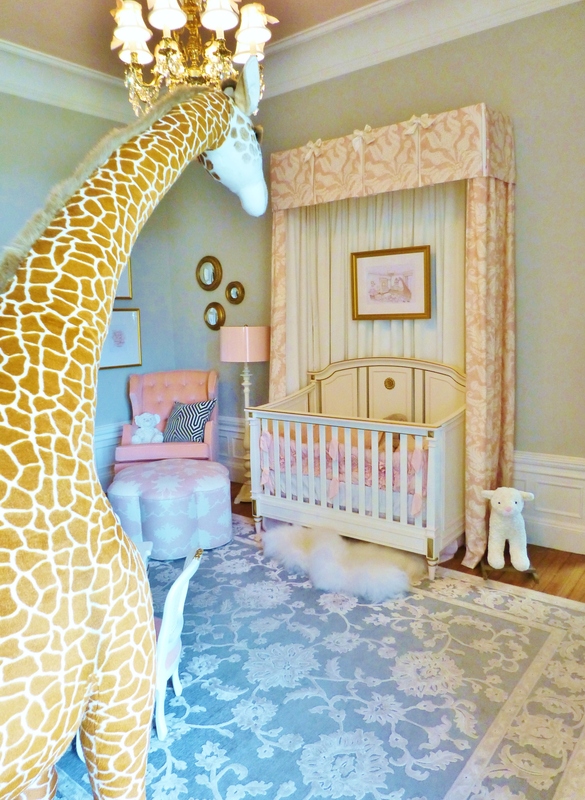 The designer of this high-end infant abode, Ms. Badolato, did a fantastic job in making the nursery feel luxuriously feminine, while not coming across too saccharine and overly sweet. Bright white trim and a high-gloss blush ceiling are striking against the warm grey walls in this baby’s room. The raised damask motif area rug is super soft and adds pattern and interest to the space. A pagoda-style bookcase adds a whimsical touch next to the fleshy pink velvet upholstered rocking chair. The flower shaped ottoman is adorable too! Notice the high-gloss pink lampshade on the floor lamp and the very cool artwork and circular mirror grouping. I also especially like the geometric fabric on the custom pillow…definitely not your average, run-of-the-mill baby’s room! The only photograph I have on file of the beautiful custom draperies has my own ‘baby’ in it….he’s 14 now, but I remember when he was a tiny little thing! Anyway, the draperies here are lovely–a chinoiserie fabric with a wide embroidered band at the leading edge is a sophisticated choice for this little one’s room. Not to be missed in a far corner of the room is a nearly life-sized stuffed animal giraffe!! He’s just the playful whimsical touch this little girl’s room needs. A detail of the stunning canopy surrounding the precious white crib. 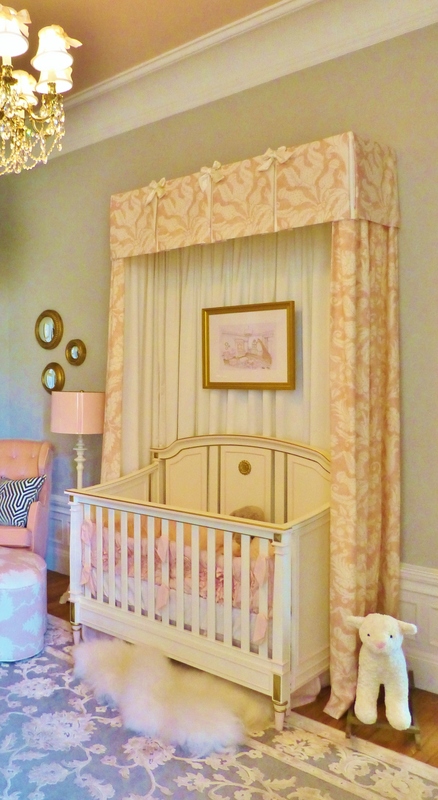 The artwork hung inside the canopy is the designer’s rendering of this stunning nursery. So, what did you think of the ‘La Petite Rose’ Nursery at Blairsden, the Mansion in May? Did you love its fleshy pink and warm grey color scheme as much as I did? Please take the time to leave me a comment, I love to hear from you! Until next time, tell everyone you know about Kristine Robinson’s Blog–I need all the friends I can get! Kristine Robinson’s contact info and services. This entry was posted in Decorating, Designer House, Home Decor, Interior Design & Decorating, Nursery and tagged Baby's Room, Children's Rooms, Color, Crib, Decorating, Furniture, Interior Design, Interiors, Mansion in May, Pink, Robinson interiors, rugs. Bookmark the permalink. Loved the photo of your baby…he’s getting so big. This nursery is so pretty too!